As co-directors of Measure of America, we are gratified by the lively exchange of ideas among citizens we have seen in Marin County, California over the last two months in connection with A Portrait of Marin, our first-ever county-level American Human Development Report. As always, we aimed to stimulate fact-based dialogue by providing easy-to-use, methodologically sound tools for understanding the distribution of well-being and opportunity. Commissioned by the Marin Community Foundation, A Portrait of Marin looks at how Marinites are faring by place and by gender, race, and ethnicity using the American Human Development Index, a measure of life expectancy, education, and earnings. In other words, we combined official statistics on how long people are living, the proportion of children and young people who are in school, the highest academic degree adults have attained, and the salaries of typical workers into a single number that falls on a scale from 0 to 10. GDP tells us how the economy is doing. The American Human Development Index tells us how people are doing. The Index is based on a methodology developed at the United Nations that has been in use for over 20 years in 150 countries. This work became the international gold standard for measuring well-being because it provided a much-needed diagnostic tool for policymakers and the general public to understand where they were succeeding in creating opportunity and where more effort was needed. And rather than focus only on economic metrics, the human development approach offers a way to address health, education, and living standards in the interconnected way that people actually experience them and opens a space for developing comprehensive and lasting solutions to challenges in these areas. Our experience from Mississippi and Louisiana to California has been, somewhat counter-intuitively, that people who find themselves in the top spots on the Index often argue that they don’t actually belong there. We are not asserting that people in high-scoring locales—from Ross in Marin to the Upper East Side of Manhattan—have no problems or poverty. A high score on the American Human Development Index does not inoculate a place or group of people from the challenges inherent in the human condition; hearts break, cancers take hold, and life disappoints in affluent and struggling communities alike. But there are very concrete differences that matter for people’s lives and life chances—such as a 13-year life span gap between high and low-scoring communities in Marin, or the fact that Asian Americans in New Jersey live, on average, an astonishing 26 years longer, are 11 times more likely to have a graduate degree, and earn $35,610 more per year than South Dakota Native Americans. Life is not perfect for Asian Americans in New Jersey, but the typical Asian American in New Jersey nonetheless has a far more robust set of capabilities for living to their full potential and investing in themselves and their families than the typical Native American in South Dakota. Likewise people living in Ross as opposed to people living in the Canal area of Marin. 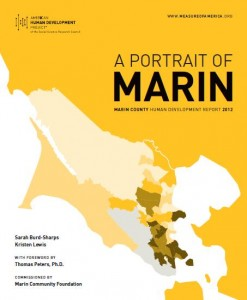 We invite people who have not yet had a chance to read A Portrait of Marin to do so, and to explore the interactive mapping program that allows users to map several dozen indicators by census tract in Marin and across the country.